“Chye-yean” (菜燕),Chinese (Hokkien?) for agar-agar. However, I have only ever heard the term ‘agar-agar’. The first thing that pops into my mind are the colourful agar agar jellies from my primary school tuckshop. Baking Mum has some exquisite versions of the traditional layered agar agar dessert here and here. Most interesting to me is the strong historical Malayan connection to this seaweed-derived product, which is evidenced by the fact that its international name today is the Malay word ‘agar’. The entry on SinglishDictionary.com lists fascinating colonial references to agar in Malaya from 1813, 1820 and 1894 and opens a little window on how this Southeast Asian item made its way further afield. While some equate agar agar with Japanese kanten, this information says that in Japan, kanten and agar-agar refer to separate products made from different kinds of seaweed and have different textures. The additional details here suggest that outside of Japan, this distinction may not be so important and the term ‘agar-agar’ is used in a broad fashion to denote a whole family of seaweed products. Agar has the advantage of not melting, which is very handy in our tropical weather. It can even set without refrigeration. Another wonderful thing about agar agar is that you can use it to gelatinise (is there such a word?) almost any liquid, except vinegar and foods high in oxalic acid, which includes spinach, chocolate and rhubarb (read more in this article). Agar agar comes in two forms — long strips and powder. I assume that back in grandmother’s time, they didn’t have agar agar processed into easily-spoonable powder and packaged in handy single-use sachets that we use today :), so this most likely refers to the strips. To use agar strips, rinse in cold water first and leave them to soak until softened. Then boil in the required amount of liquid until it melts. I have no idea why there are two sets of quantities for the Chye Yean with one being twice as diluted as the other. The amount of liquid used affects the hardness of the agar jelly when it sets, so make it less dilute if you like a ‘crunchy’ texture. Tahils and katis (“K.” in the recipe notes )are such nostalgic measures of weight :), bringing to mind vivid memories of following grandmother to the wet market as a young child. See this conversion table for katis (cattys) and tahils to metric or imperial measurements. I had some problems working out this recipe. Firstly, I misread grandmother’s handwriting as ‘Tim Kor’ instead of ‘Fun Kor’. 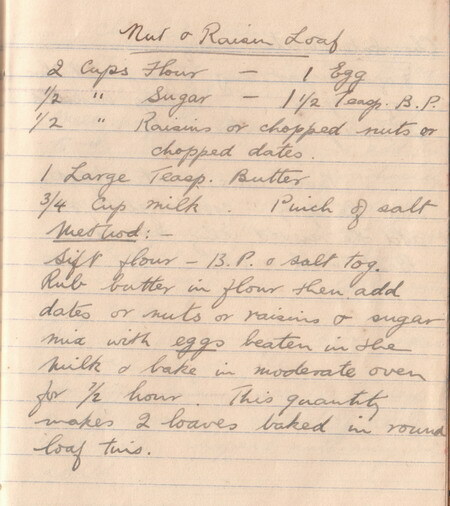 Secondly, she wrote a second recipe on the same page in the same pen for ‘Chye Yean’. As there were no cooking instructions, and only partial ingredients for the Fun Kor, I failed to realise what dish was being written about. Thanks to the fabulous readers here, I’ve got it all sorted out now. Please see the comments from Chris, Lily Ng and Claire below. Fun Kor 粉果 is a steamed dumpling, originally a Teochew dish, but more commonly known by its Cantonese name. I surmise that this is because of the Teochew (Chiu chow) influence in Hong Kong. Fun Kor is commonly found in dim sum, a style of eating that developed in Hong Kong. In the comments below, reader Claire also provides instructions on how her mother makes the Fun Kor skin, using similar basic ingredients to my grandmother, as well details of the meat filling. I’m sure you can find other recipes on the internet and in dim sum cookbooks. Claire refers to ‘jicama‘, which is known in Singapore/Malaysia as bangkuang. So grandma’s notes here are only for the flour proportions for the Fun Kor skin. You’ll need to add water and cooking oil as well, not to mention making the filling of your choice. Tung mean” flour refers to wheat starch, which goes by various Chinese names: 澄 麵粉／澄粉／澄麵, usually used in dim sum dishes to give a glossy sheen to the food. It’s easily available in Singapore supermarkets that have a good selection of Asian flours, such as NTUC, or baking suppliers like Phoon Huat. Is kaya a custard or a jam? 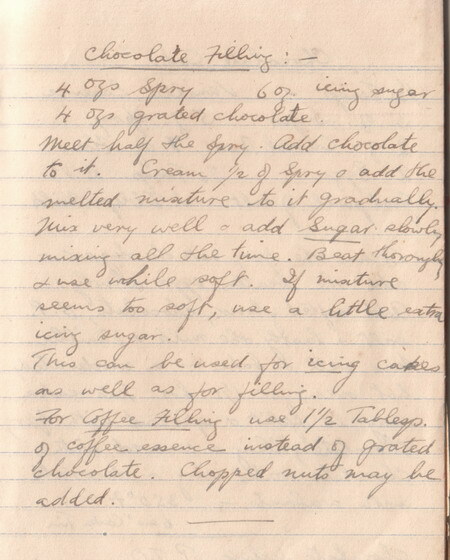 Cracking my head over this semantic question has kept me from posting this recipe — not even that, but mere notes on ingredients — which grandmother noted down. She has listed two sets of quantities, the one on the right originating from her friend, “Mrs S.K.”. Grandma wrote ‘coconuts’ but experienced cooks would know she was referring to the number of coconuts needed to produce the correct amount of coconut milk (here’s how to do it using grandma’s traditional grater). According to Wikipedia, the name srikaya, usually shortened to kaya, is derived from ‘the word meaning “rich” in Malay’, and being based on eggs and coconut milk, rich it certainly is! Locals hoping to cut down on their cholesterol intake know that this is one food to reserve for occasional treats only :). I’ve only ever known this as kaya, and grandmother’s notes are the first time I’ve seen it called sri kaya, which leads me to surmise that the full name was in common usage in the past but has long since been shorted, with the original word now disappeared from popular knowledge. The use of coconut milk also pandan leaves (in most kaya recipes) points clearly to Southeast Asian origins, either Malay or Indonesian, and the Philippines have their own version as well. Kaya is also very much associated with Straits Chinese (nonya) cooking, which is hugely influenced by Malay and Indonesian cuisine. A popular type of nonya steamed desert is kueh salat, glutinous rice stained with blue colouring from the butterfly pea flower (bunga telang) and topped with kaya. However, perhaps what Singaporeans think immediately at the mention of kaya is kaya toast, which some overseas friends have told me is their favourite Singapore food :). Kaya toast is found in traditional local coffee shops, known colloquially as kopi tiam, which historically have often been the preserve of the Hainanese community. Many Hainanese worked in the food industry, often as personal cooks for the colonials as well as wealthy Asians. Bread and toast formed a daily staple in colonial Singapore, and not just amongst the European population. In Hainanese kopi tiam, western bread in the form of charcoal-grilled toast was spread with sweet, rich local kaya. These days, traditional enterprises have adopted modern business strategies, Ya Kun Kaya Toast being one of them. With humble origins in the 1930s, it is now a franchise in six countries outside of Singapore with a distinct branding leveraging off its long history and a nostalgia for the old days. Grandma’s notes won’t help you much if you don’t already know how to make kaya, so this webpage describing someone else’s grandmother’s kaya method might prove very useful. Although I’ve never made kaya myself, I’ve heard it requires plenty of patient stirring to get a good consistency. Nowadays, many people use a microwave shortcut, a slow cooker or even the jam function on a bread maker. What’s also becoming more popular now is a vegan, eggless pumpkin version that is not only healthier but much easier to prepare. So — custard or jam? well, actually I don’t think it matters :). This icing is meant to go with Chocolate Cake. The recipe uses hydrogenated vegetable shortening, under the Spry brand name. I’ve commented on the history, use and health considerations of using Spry or its competitor brand, Crisco in an earlier posting. My personal choice would be to use butter, which would probably also give a better taste. This is the filling that goes with Chocolate Cake, but you could use it with other cake recipes too. This recipe uses hydrogenated vegetable shortening, under the Spry brand name. I’ve commented on the history, use and health considerations of using Spry or its competitor brand, Crisco in an earlier posting. My personal choice would be to use butter, which would probably also give a better taste. 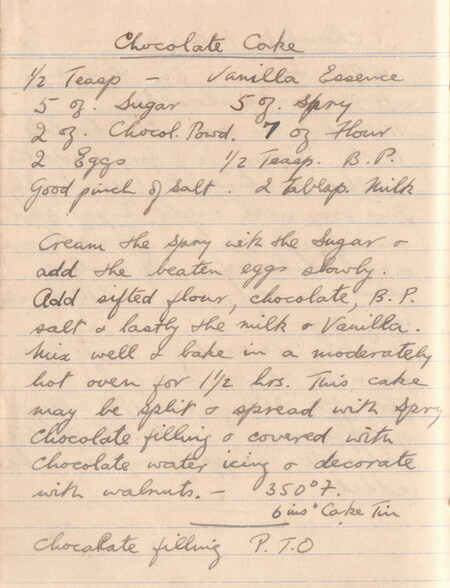 This is a straightforward cake recipe using the creaming method. You might want to refer to the tips on creaming here and here. Instead of butter, this recipe uses hydrogenated vegetable shortening, under the Spry brand name. I’ve commented on the history, use and health considerations of using Spry or its competitor brand, Crisco in an earlier posting. My personal choice would be to use butter, which would probably also give a better taste. This quick bread basically uses the muffin method of mixing: dry ingredients in one bowl, wet ingredients in another, mix together very quickly till just blended. The difference is that it is baked into a large cake, rather than small muffins. For me, I often do the opposite and bake cake recipes into muffin or cupcake sizes because they need less time in the oven and hence use less electricity. Don’t let the ‘rub butter in flour’ bit fool you into thinking this uses the rubbing-in method (see Plain Scones). Here, it is just a way to incorporate solid butter. Other recipes melt the butter and combine it with the wet ingredients. Personally, I’m lazy to melt butter when I make muffins, and usually use oil instead :). A cooking oil with a neutral flavour is best, but coconut oil will give a strong tropical flavour if that’s the effect you intend to produce. 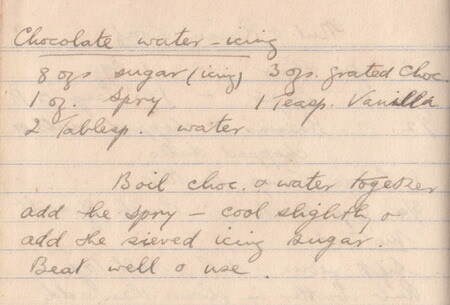 For more on oven temperatures, see grandma’s notes here.